If you don't have access to a large garden or an allotment you may want to try and grow your own veg in a patio, thanks to specially made containers. They come in different shape and size, according to what can grow inside them, and once planted they are as useful as decorative. We've had a look at some different versions of vegetable planters for a small garden or patio, take a look yourself at what we found and see if there's anything you could benefit from. Links for purchasing them are included. Here is a small selection of vegetable planters for a small garden or patio, to give you an idea of different range of price and style. Attractive tiered planter, size128H x 64W x 32D cm. Ideal for plants and herbs, it's made form pressure treated softwood and comes with a 15yearsanti rot guarantee. Capacity 90 ltir, the reusable growbag is the perfect ecoalternative to commercial growbags. Lots of space for nutrient waterreserves and all the compost you use in it can be reused over andover again. Perfect for greenhouse, patio, balcony and decked areasand for growing vegetables such as tomatoes, cucumbers - or evenflowers if you prefer. When choosing a container for your vegetables make sure thecontainer is large enough to hold the plant and has drainage holes todrain excess water. If you prefer yo can choose larger containers asthey hold more soil and water therefore require to be watered less. 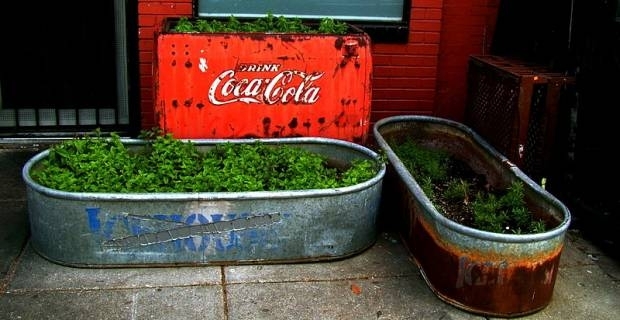 If you are thinking of reusing various containers to use as vegetable planters for a small garden or patio, make sure you add several drainage holes to them. Use a 1/4-inch drill bit and pierceholes in the bottom or along the sides near the bottom. Then line the bottom of the container with screen or landscape cloth to prevents oil from spilling out.